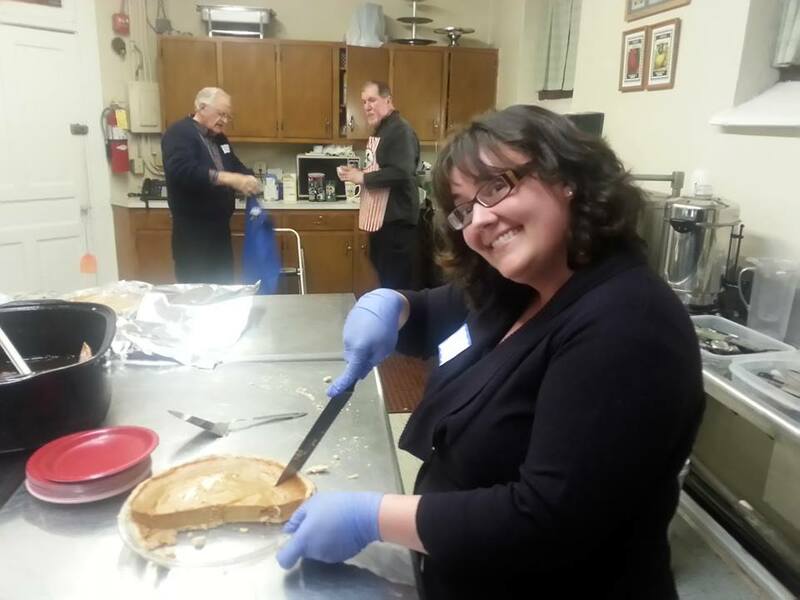 Calvary UMC Newsletter for October 2015 - Fall is finally here and with it is a packed calendar!! See what's happening at Calvary! Everyone is welcome at this new annual tradition at Calvary! The evening will begin with a turkey dinner with all the trimmings including pumpkin pie. 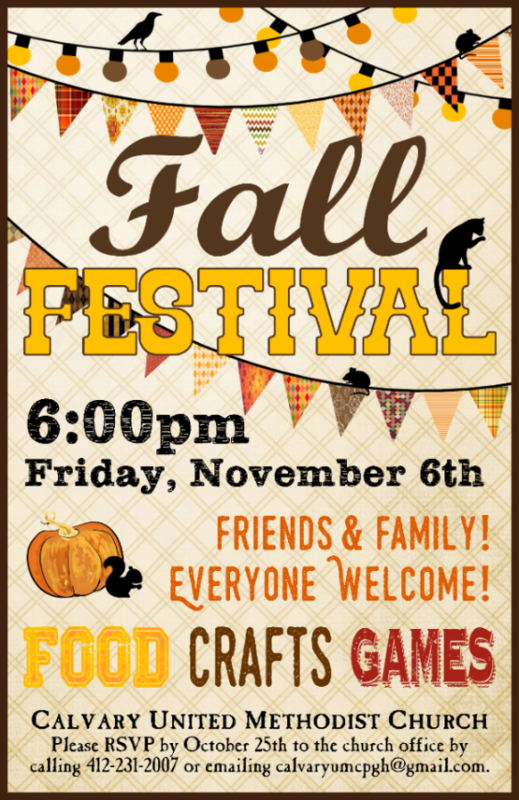 After dinner there will be crafts and games that everyone can participate in. Please RSVP by Sunday, October 25th so that proper planning can be done for the meal and activities. It promises to be a wonderful evening of great fellowship and fun! 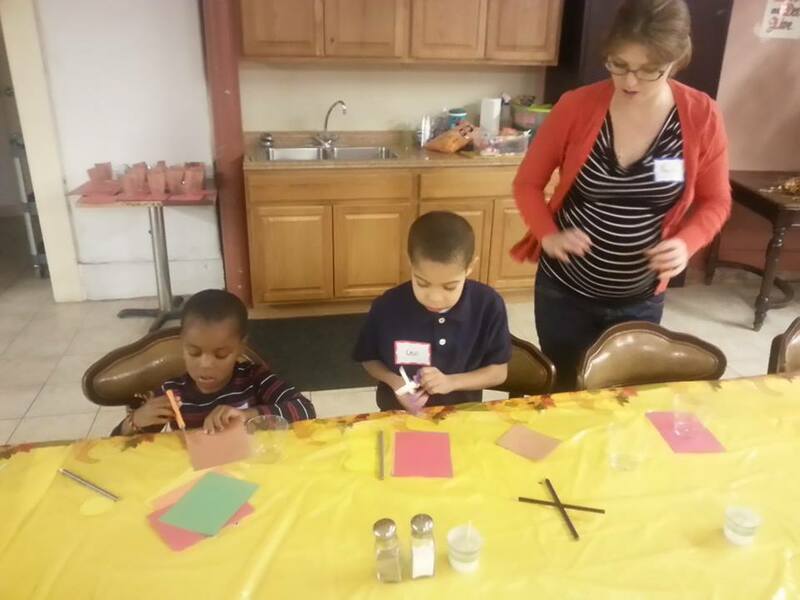 Here are some pictures from last year's Fall Festival! The Old Allegheny Antique Show (September 12th and 13th) was a rousing success. Martin Fuess, a Manchester resident and long time friend of Calvary, recruited nineteen dealers who filled all available Calvary space with a wide array of antique furnishings, glassware, art, jewelry, etc. More than 275 people visited the show over the weekend. 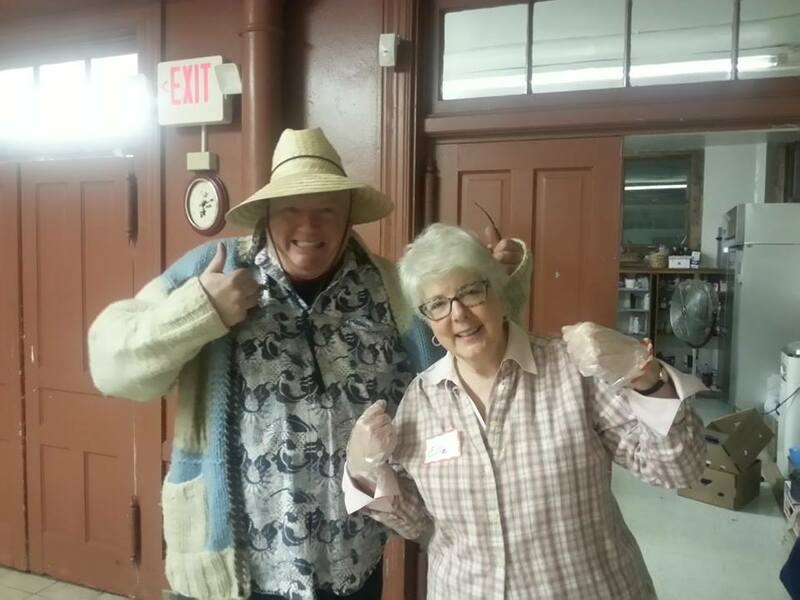 Although this show was the first for Martin, a Calvary member had hosted a weekend antique show in years' past, so the church had some previous experience with this type of event. The church received a portion of the admission price. Members donated items to sell at the Calvary booth. The Calvary Café was open all weekend and sold great food. Donation jars were available in the sanctuary. Calvary's income from the event was $3,600.00. There are also intangible benefits from an event like this. The dealers reported that they really appreciated Calvary's welcoming spirit and several of them attended church services on Sunday, September 13th. We were able to share information about the upcoming Messiah concert, and we hope that visitors will spread the word that Calvary is a vital, active congregation. At the close of the show on Saturday Rev. Larry gave a brief orientation about the church and then Brian Burns, Music Director, gave an organ recital--another great way to share Calvary's talents with the larger community. 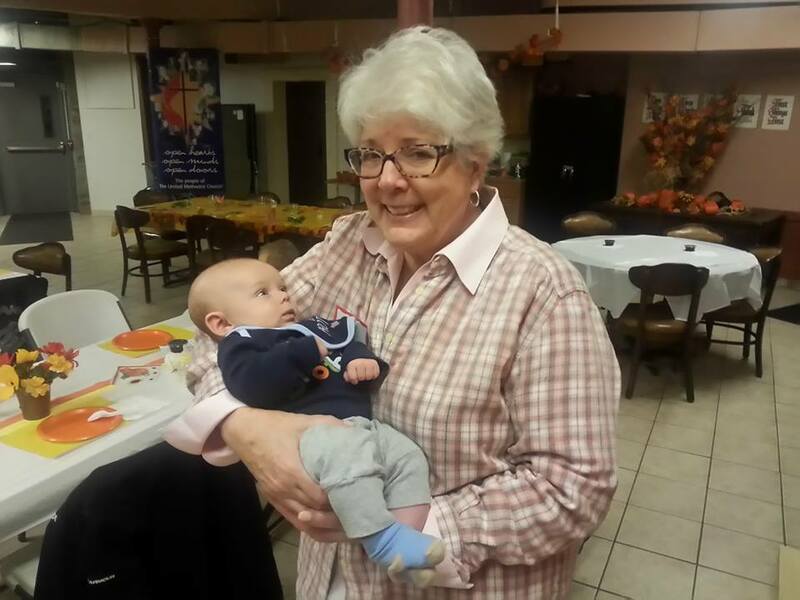 As approved by Church Council, the antique show income will be shared equally among the following: UMCOR, local missions, Children and Youth Programming, the Pastor's Discretionary Fund, and the sanctuary lighting project. 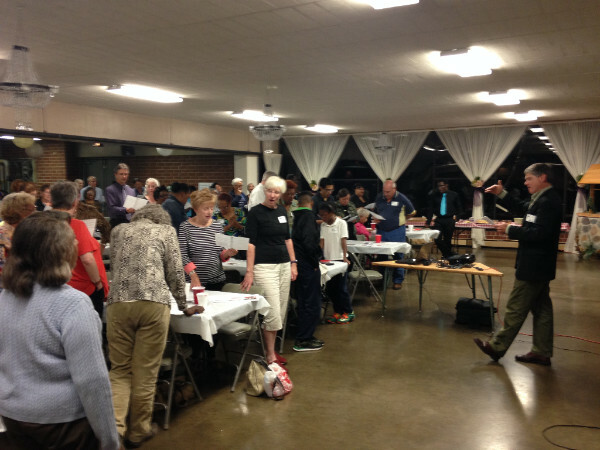 On Tuesday, September 29th, Northside Common Ministries (NCM) held the fourth annual Congregational Assembly dinner at Bidwell Street Presbyterian Church. 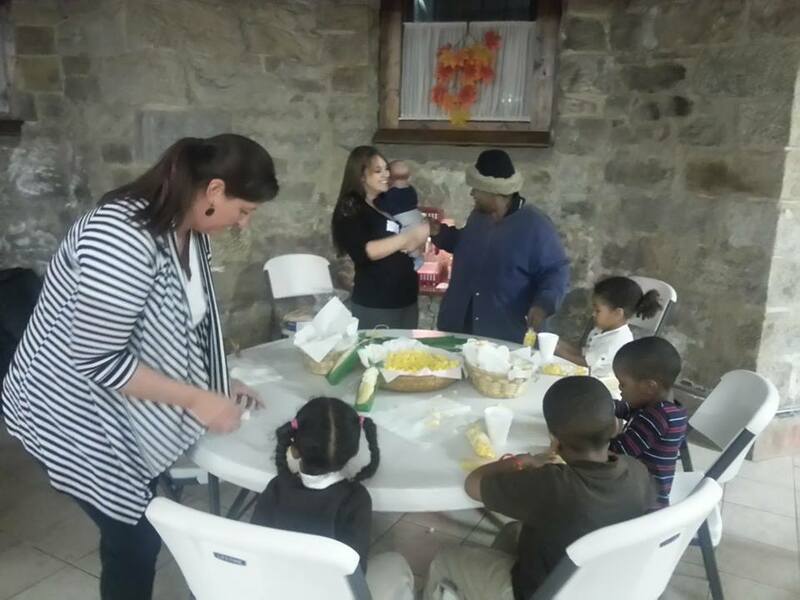 Over 70 people celebrated the churches that volunteer time and money to the various NCM programs - the food pantry, the men's shelter, etc. 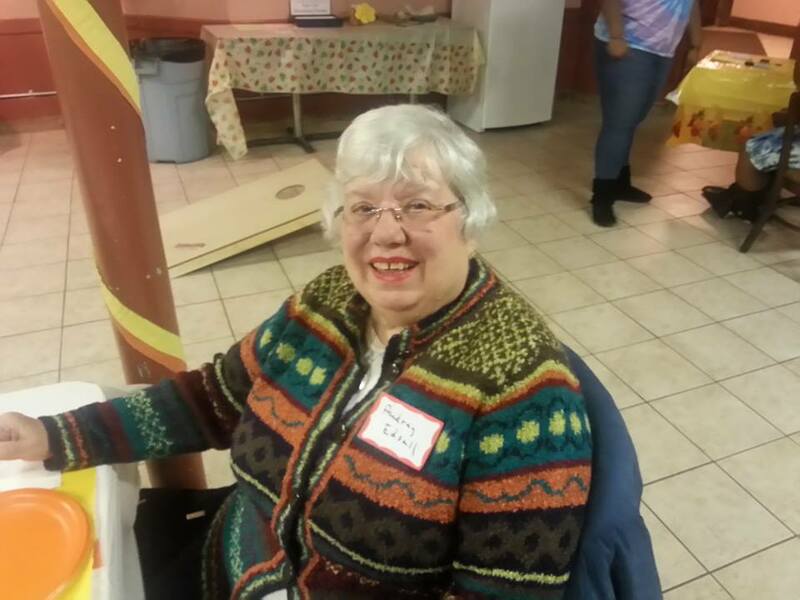 Attendees heard from Judy Gerry, a member of Bidwell and a long-time NCM board member and Darlene Rushing, a NCM neighbor who has used social media to raise much needed funds for the pantry. She announced that pantry upgrades will be unveiled in mid-October. The intent of the upgrades is to make a visit to the food pantry feel more like a supermarket shopping trip. 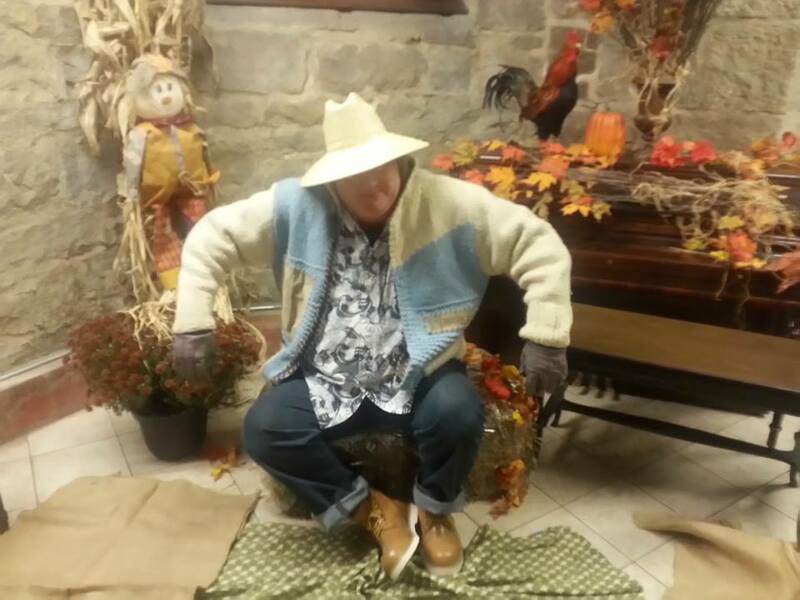 Jay Poliziani, Executive Director of NCM, presented a video highlighting one of the men and also his special relationship with "Annie", a therapy dog and full-time shelter resident. 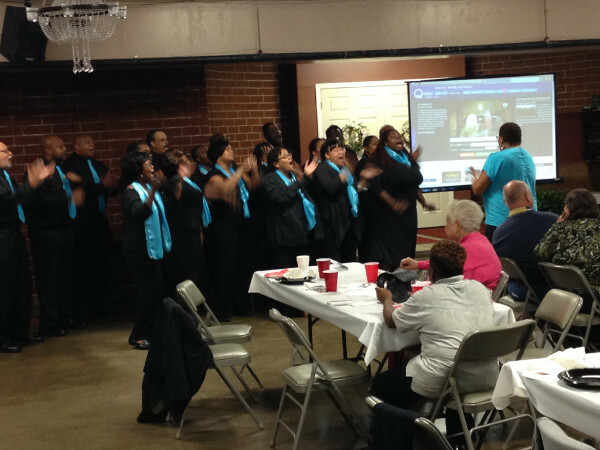 The Bidwell choir shared the gospel in song, and the evening closed with everyone joining in to sing Blessed Assurance. The following are a few pictures from the dinner. 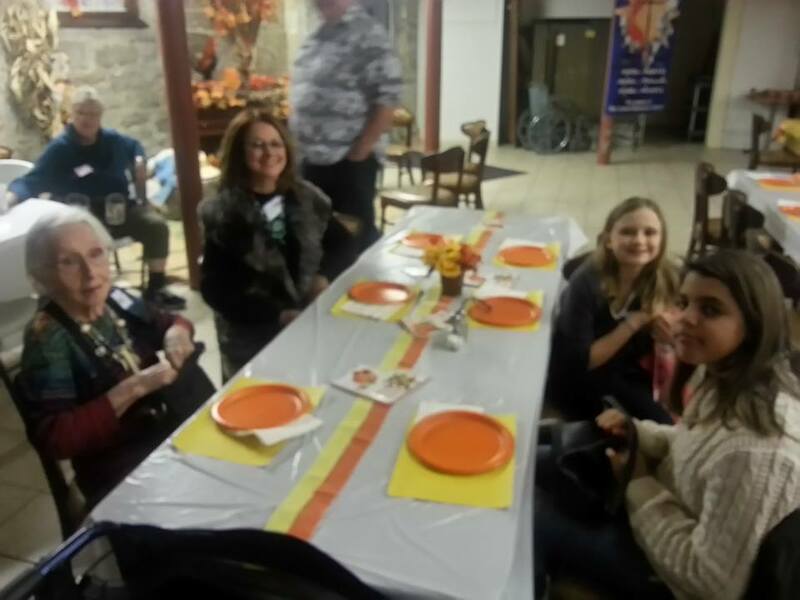 The Northside Common Ministries Celebration of Caring is Friday, October 23rd at 6:00pm. Each year the Celebration of Caring honors volunteers who are out there helping the hungry and homeless in our city. Your $75 donation gets you a delicious meal, great entertainment and an evening filled with heartwarming speeches. All proceeds benefit the Pleasant Valley Homeless Men’s Shelter. This is the dinner where Calvary was honored last year. It is to be held at the Grand Hall at the Priory (The Grand Hall at the Priory, 614 Pressley St, Pittsburgh, PA 15212). For more information or to order tickets please contact Jay Polizian at either 412.323.1163 or jay.polizian1@ncmin.org. Proceeds from the sales of the Calvary Water Bottles will go directly towards funding the Fall Festival and the Children's Christmas Party. Calvary Water Bottles Now On Sale! 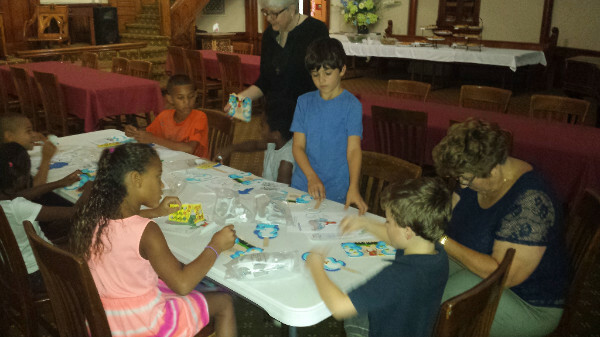 During VBS this year, all of the children and volunteers were given a Calvary water bottle. 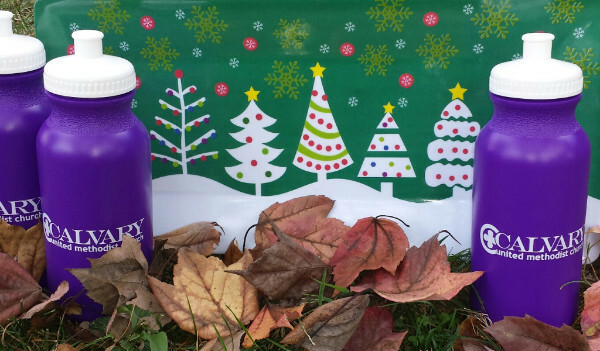 During the upcoming weeks, the Children and Youth Committee will be selling the remaining water bottles as a fundraiser to raise money for the Fall Festival and the Children’s Christmas Party. The water bottles will be raising funds in two different ways. Not to mention that it's also a healthy fundraiser! So how does it raise money in two ways? The first way is the obvious - through the sale of the water bottles! The second way is through advertising on the bottles. We have the Calvary logo on the bottle and wherever those bottles go; Calvary will be promoted! The water bottles will be on sale for only $3.00 or 2 for $5.00. They will be available in the Chapel before Sunday morning worship and also during fellowship time in the Fellowship Hall. This is an exciting time for Calvary! The number of children in our church is growing. Please help the Children and Youth Committee continue to provide our children with amazing programs! Join us Sunday, October 11th, for an informal luncheon in the chapel. This is an open invitation to all women to attend an informational luncheon after church on Sunday, October 11th in the chapel at Calvary to learn about the organization of United Methodist Women. Whether you’ve never heard about UMW or you’re someone who knows about and would like to see a local unit be a part of Calvary, you’re welcome to come. We would like to reorganize the unit which had a tremendous history in this church, according to Jane Johnson. There will be lunch, brochures about UMW and also, some fun! A main course lunch item will be provided. Please bring an item to the luncheon like a dessert or chips, etc. No reservations are necessary but please come. If you have any questions or are interested but cannot attend please contact Joan Bradley at ogremtb@aol.com. Have you heard about United Methodist Women? Did you know that hundreds of thousands of women around the world are a part of this organization? The organization had its beginning almost 150 years ago when Methodist women gathered together realizing that women and children in the United States and around the world needed help and were not being served by male missionaries. The organization has a long history of aid and service to women, children, and youth. Did you know that Calvary used to have a local unit of United Methodist Women? Somehow it has gotten lost over the years but we can begin again. Many of us could once again enjoy the company of women supporting one another in community and action. The organized unit of United Methodist Women shall be a community of women whose purpose is to know God and to experience freedom as whole persons through Jesus Christ, to develop a creative, supportive fellowship; and to expand concepts of mission through participation in the global ministries of the church. From the purpose you see that the organization exists to support one another and gather funds for hundreds of mission projects around the world. Anyone and everyone is welcome to become a member of our local unit. 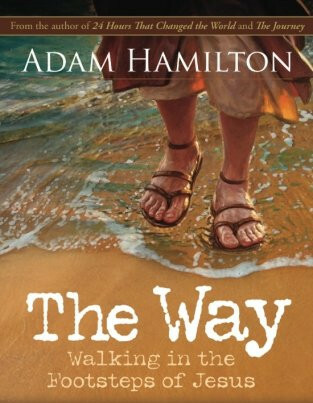 "The Way - Walking in the Footsteps of Jesus"
Have you ever wanted to visit the Holy Lands? Adam Hamilton takes us on a six week tour of the Holy Lands as we walk in the footsteps of Jesus. We will begin at the Jordan River and follow in the footsteps of Jesus all the way to the cross. Reading the book "The Way" we will gain insight on the life of Jesus. 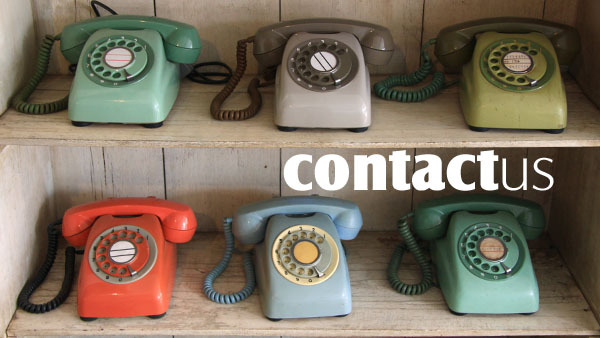 Please contact Rev. 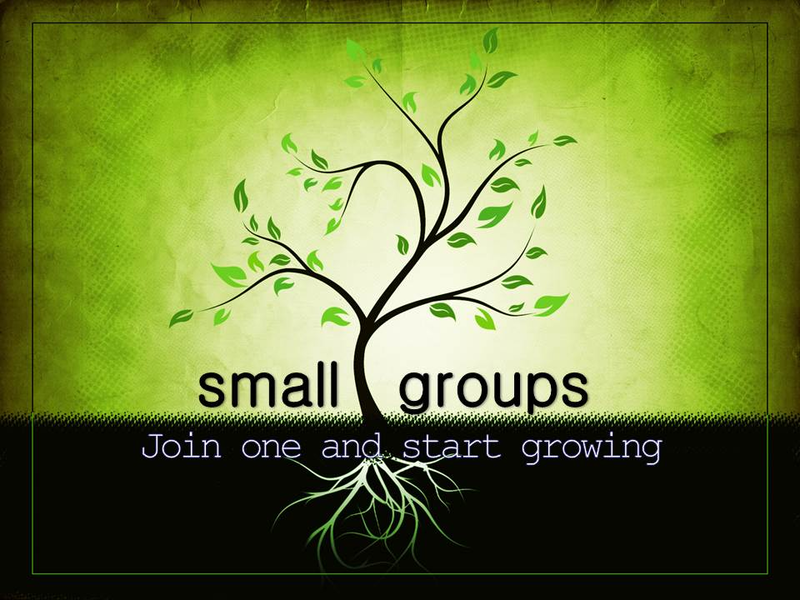 Ellie Laws if you would like to join this Bible Study Group. There are two studies available. A donation of $10.00 is requested for each book. 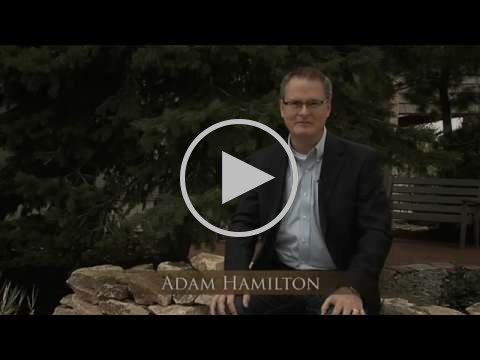 Watch a preview of "The Way - Walking in the Footsteps of Jesus"
Travel with Adam Hamilton as he retraces the life and ministry of Jesus Christ. Using historical information, archaeological data, and stories of the faith, Hamilton follows in the footsteps of Jesus from his baptism to the temptations to the heart of his ministry, including the people he loved, the parables he taught, the enemies he made, and the healing he brought. On October 16-17, hear first hand accounts of life in Gaza and the West Bank and learn why activists work day in and day out for peace and justice in the U.S. and Palestine during a Friends of Sabeel conference at Pittsburgh Theological Seminary. Rev. Alex Awad, who recently retired as UMC Missionary in Bethlehem, will lead a Friday afternoon workshop. For more information, or to register, see http://fosna.org/pghconference - or contact Rev. Myles Bradley. 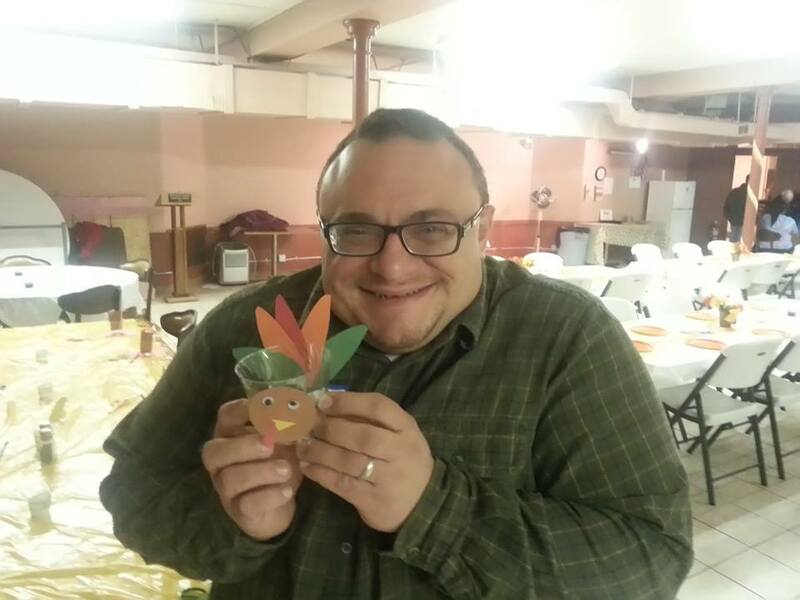 Also, on Sunday, October 18th, Daoud Nassar from the Tent of Nations will be our guest preacher at Calvary UMC. Following morning worship he will share the story of his family vineyard and the conflict with Israel as well as answering your questions about his life in Palestine. 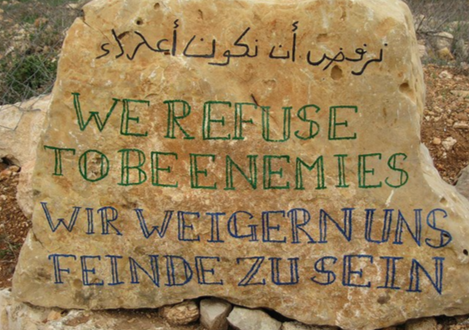 The stone in the photo rests at the entrance to the Tent of Nations, a farm and peace center, near Bethlehem, owned by the Nassar family who are Palestinian Christians. The Israeli government is trying to confiscate the Nassars’ land, which they have owned for nearly a century. Their struggle embodies the power and beauty of the nonviolent movement. The Ugly Quilt Project is underway! We are in need of old blankets that can be recycled into sleeping bags for the homeless. Please consider donating old blankets to our project. Please see Lynn Sevick if you have any questions. Please pray for the families who are risking their lives to settle in other parts of the world to receive the basic supplies and services they need to survive. In a recent statement concerning the migration crisis in Europe and around the world, Thomas Kemper, general secretary of Global Ministries, of which UMCOR is a part, cites the agency’s ongoing work with international partners in bringing assistance to those uprooted and displaced from Syria, Iraq, and elsewhere. Kemper went on to state that next steps in ministries with asylum seekers will be guided by recommendations from the European Methodist Council in a meeting set for this month. Your gifts to the International Disaster Response, Advance #982450 will support UMCOR's ongoing work with refugees and migrants, and in response to other emergencies across the globe. Please donate to UMCOR International Disaster Response, Advance #982450.
or by calling 1 ­800 ­554 ­8583, where credit card donations are accepted. You can also give online by clicking any of the "DONATE" links or make a $10 donation anytime by texting "UMCOR" to 41444 to support our relief efforts around the world. UMCOR is exempt from tax under section 501(c)(3) of the Internal Revenue Code of the United States and qualifies for the maximum charitable contribution deduction by donors. Sponsors are needed for upcoming months thru the end of the year. All are invited to raise their voices together in a classic holiday choral work during the 5th Annual Handel's Messiah Sing-Along at Calvary United Methodist Church on Saturday, December 5th at 4:00pm. Calvary's Music Director Brian Burns will once again be conducting this year's concert along with David Bridge on the organ and chamber orchestra. This holiday tradition now brings up to 400 people to Calvary UMC to sing selected choruses including the famous "Hallelujah Chorus". No audition is required to sing, just join the rehearsals listed below. Audience members are asked to bring 1-pound non-perishable food items for the pantry at Northside Common Ministries. Cookie reception with the artists follows in the Victorian Chapel. It's a fantastic way to kick off the holiday season, and we invite everyone to join and sing for the joy of it! Children 12 and under admitted at no charge. Military service members and veterans admitted at no charge. Tickets can be purchased at the door (cash or checks accepted) or http://www.showclix.com through noon on Saturday, December 5th. Tiffany meets Handel! Join us for Pittsburgh's new holiday tradition! Sing a choral masterpiece surrounded by Tiffany masterpieces at the magnificently restored Calvary United Methodist Church in historic Allegheny West. Since 2011, this concert has been practically a sell-out! Singers are sought for the Festival Choir. All voice parts are needed. No auditions required! 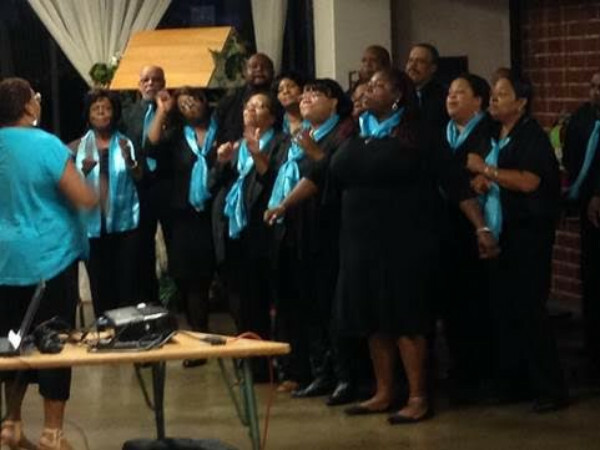 Choir members join the core ensemble – the Renewal Choir of Calvary United Methodist Church. (Choir positions are unpaid.) Please email to confirm your participation and with any questions to CalvaryUMChurchPittsburgh@gmail.com. You will then receive a complete information packet. The choir is using the Watkins Shaw/Novello score. Rehearsal CDs may be made upon request if you don't have internet access, otherwise, links to videos for all voice parts will soon be found on Calvary's YouTube channel at Calvary UMC Pittsburgh, PA. Attendance is not required weekly, but is required at the rehearsals listed as such below. Volunteers are need for the following. If you are able to help in any way, please see either Brian Burns, Lynette Asson, or Yvonne Hudson. Sunday School Corner is the segment of the monthly newsletter that allows everyone to see what goes on in Sunday School at Calvary: the lessons the children are learning, the bible verses they are memorizing, the activities they are participating in, and the special relationships they are forming with the other children in Calvary's congregation. Our children delivered a wonderful performance to the congregation of songs taught during VBS. They went onto Sunday School where they had a recap of all three story lines from Wonders, Water and Miracles. 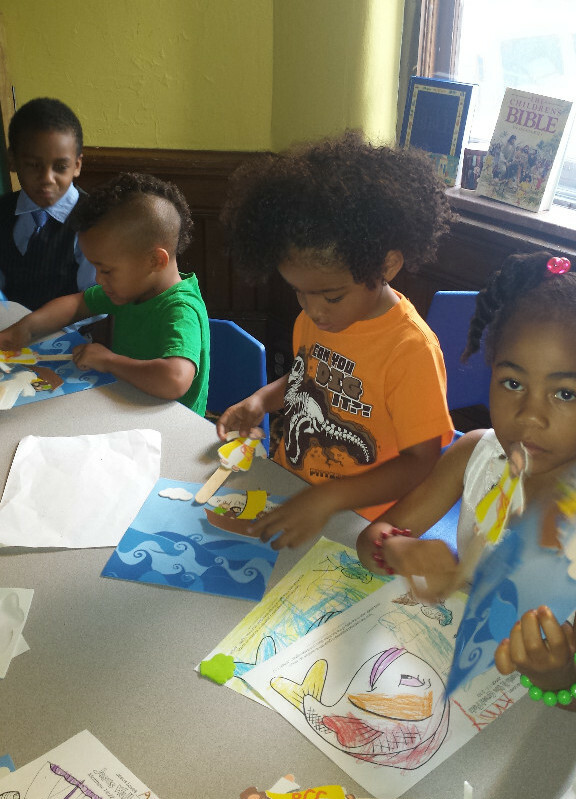 The children read verses from the Bible while constructing foam scenes. Some children were also creative with coloring pages. It back to school time! This can not only be an exciting time but very scary. 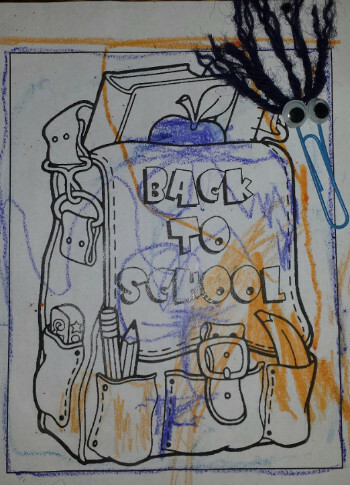 The children made fun paperclip objects to take with them to school. These are a reminder that Jesus is with us at all times and we are not alone. The children were given a #2 pencil to write the bible verse onto it as a second reminder to take along with them to school. This Sunday is the Pittsburgh Parish Family Church Picnic. What goes along with picnics ...ANTS! With that in mind, today we want to consider the ants. We can learn from the ant and become wise. The ants do their work even when they don't have someone telling them what to do or checking up on them. The children had to color their pictures with sandpaper behind it to give the surface that bumpy sand effect. 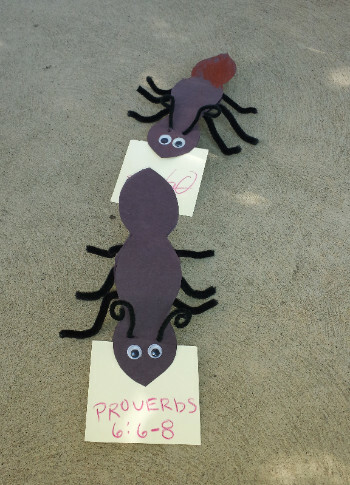 Best of all, the made their very own ant carrying the load of Proverbs 6:6-8. How does this person help others? What would happen if nobody did this work? Calvary recently enhanced the lighting in the Sanctuary, Chapel & Vestibule, and the total cost was $26,000. We are having a campaign to raise money to cover the cost of this project. An anonymous donor has offered to match every dollar donated up to $13,000. We have raised a little over $8,000 to date so we have about $5,000 to go. If you are able to donate to this campaign, please indicate “Lighting” on the offering envelope. 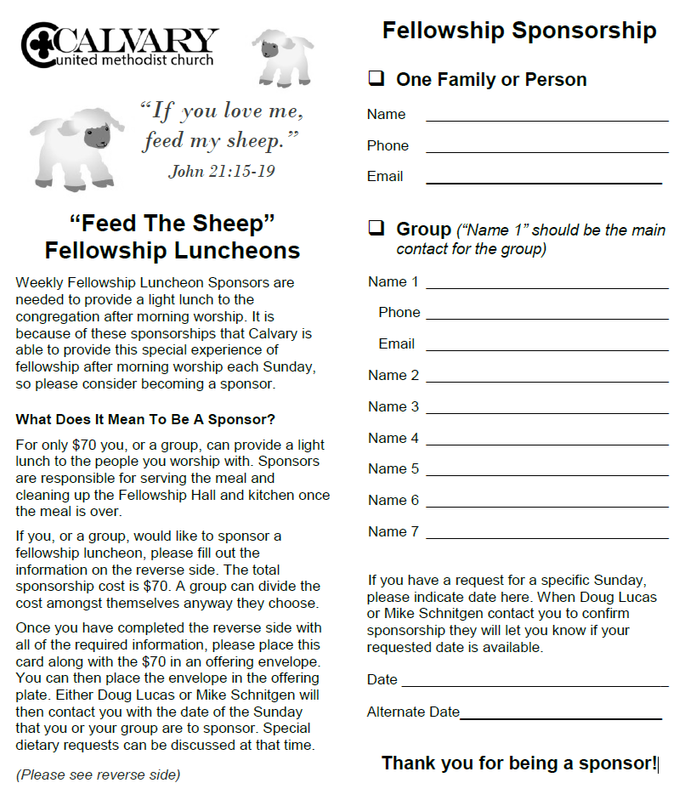 The Calvary UMC Newsletter is distributed twice a month. The first, more detailed, newsletter is sent out at the beginning of each month. 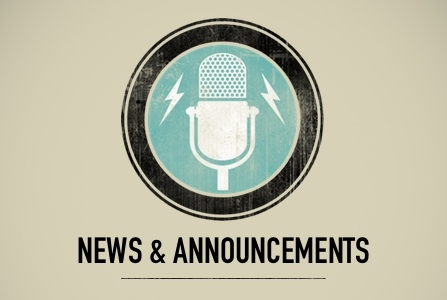 The second newsletter will contain only important Church News, the Church Calendar, Small Groups, and Prayer Requests. This second, abridged newsletter is sent out around the middle of each month. If you have something that you would like to be highlighted or printed in an upcoming newsletter please see Karen Ferguson or email her at karen.ferguson.15202@gmail.com. Join us as we study “The Way – Walking in the Footsteps of Jesus”. Everyone is welcome. There is a Study Guide donation of $10.00. There will be additional information in Sunday's bulletin. Please see Rev. Ellie Laws if you have any questions. Brian Burns’s grandmother fell this week and broke her hip. She is at AGH. Martin Fuess in the loss of his mother on Wednesday morning. 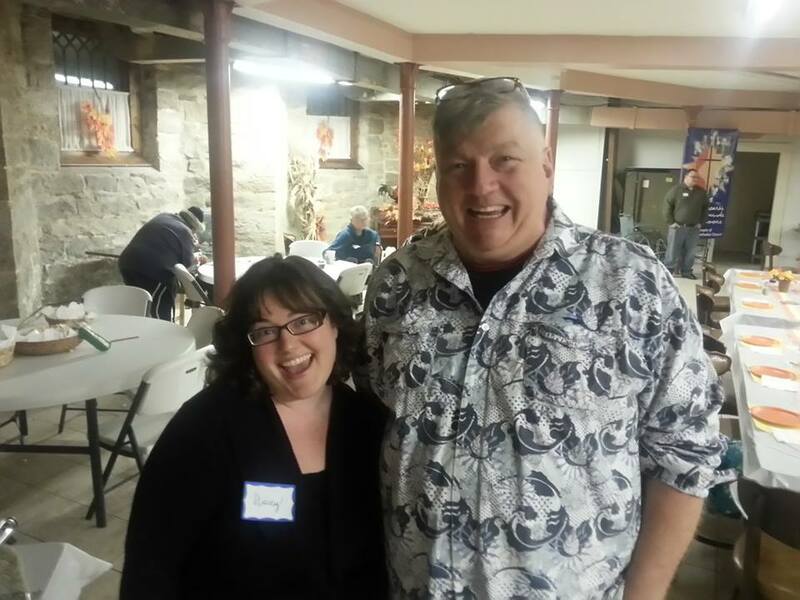 Martin coordinated the antiques dealers for the antique show in September. Paul Wittstock is at the VA Hospital recovering from double bypass heart surgery and doing well. Joan Huber who suffered a stroke this past year has returned to work. Jason Soliday’s father-in-law, Mike is recovering from surgery for lung cancer, also his mother, Mary, has a brain tumor and his wife in KC. 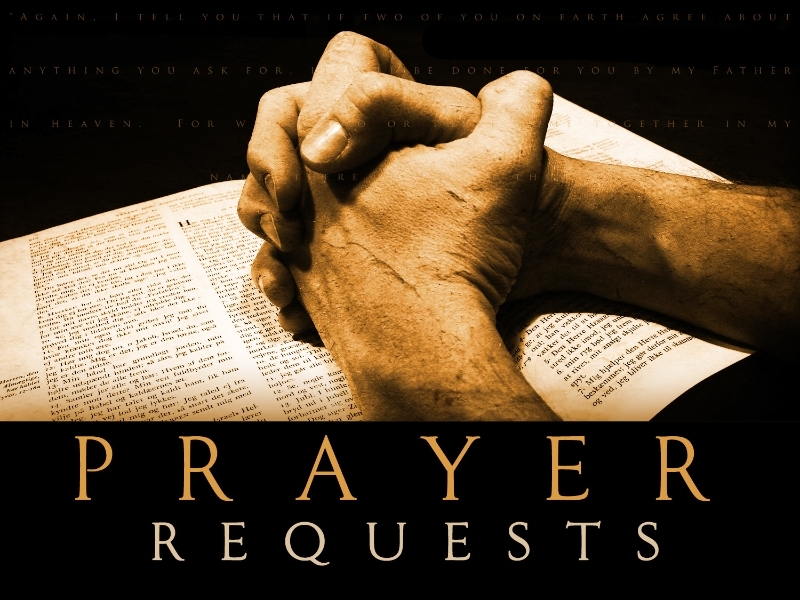 Danette Sutter asks for prayers for her family and friends. 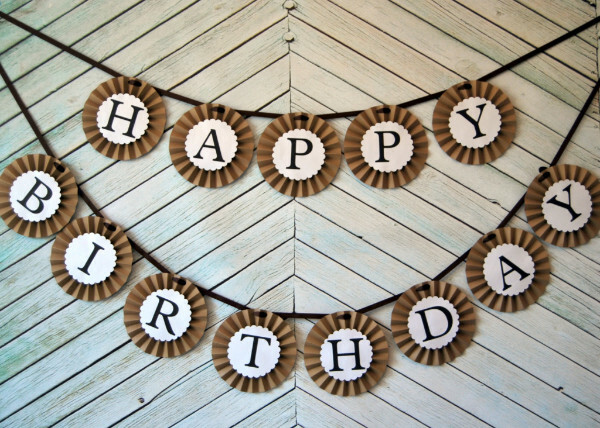 Happy Birthday to all members and friends who will celebrate a birthday in the month of October! May God bless you on your birthday and everyday in every way! Entrance is on the Beech Avenue side. Handicapped entrance is in rear of building. This is an open invitation to all women to attend an informational luncheon after church on Sunday, October 11th in the chapel at Calvary to learn about the organization of United Methodist Women. Whether you’ve never heard about UMW or you’re someone who knows about and would like to see a local unit be a part of Calvary, you’re welcome to come. We would like to reorganize the unit which had a tremendous history in this church, according to Jane Johnson. There will be lunch, brochures about UMW and also, some fun! No reservations are necessary but please come. If you have any questions or are interested but cannot attend please contact Joan Bradley at ogremtb@aol.com. Daoud Nassar from the Tent of Nations will be our guest preacher. Following morning worship he will share the story of his family vineyard and the conflict with Israel as well as answering your questions about his life in Palestine. AHPS Annual Program - "Restoring Sacred Masterpieces: Calvary's Tiffany Windows"
Members and Friends of Calvary Church are invited to attend the Annual Program of the Allegheny Historic Preservation Society (AHPS). The program will feature a presentation by Mr. Kirk Weaver, President of Pittsburgh Stained Glass Studios. Weaver's presentation is entitled, "Resorting Sacred Masterpieces: Calvary's Tiffany Windows". Weaver lead the team of conservators and stained glass artists from 2002-2005 who restored the signature Tiffany Windows that grace the sanctuary of Calvary Church. Weaver continues to assist the AHPS with other restoration/conservation projects at Calvary. Please join AHPS with this unique educational experience and learn more about the restoration of these sacred masterpieces. 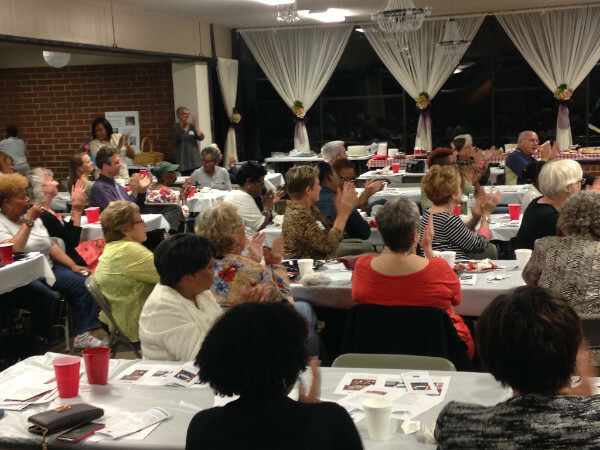 Each year the Celebration of Caring honors volunteers who are out there helping the hungry and homeless in our city. Your $75 donation gets you a delicious meal, great entertainment and an evening filled with heartwarming speeches. All proceeds benefit the Pleasant Valley Homeless Men’s Shelter. This is the dinner where Calvary was honored last year. For more information or to order tickets please contact Jay Polizian at either 412.323.1163 or jay.polizian1@ncmin.org. The 24th Tiffany Concert Season presents the "North Star Kids"
The 24th Tiffany Concert Season is sponsored by the Allegheny Historic Preservation Society, Inc. This Season features the impact the Arts have on youth resulting in a dynamic, positive impact on community at large that s far reaching to all ages. Exciting family concerts have been especially designed with Pittsburgh's most talented children and youth performers to present this theme. This concert presents the North Star Kids. An exciting performance combining two of the North Star Kids’ most popular traveling shows. “The Spirit of Broadway” is a song and dance review of past and present hits from the American theater. “I Am But a Small Voice” is a patriotic salute to the spirit of America. Much of it has been performed by the North Star Kids in Shanksville as an uplifting memorial to the victims of Flight 93. Everyone is welcome at this new annual tradition at Calvary! The evening will begin with a turkey dinner with all the trimmings including pumpkin pie. 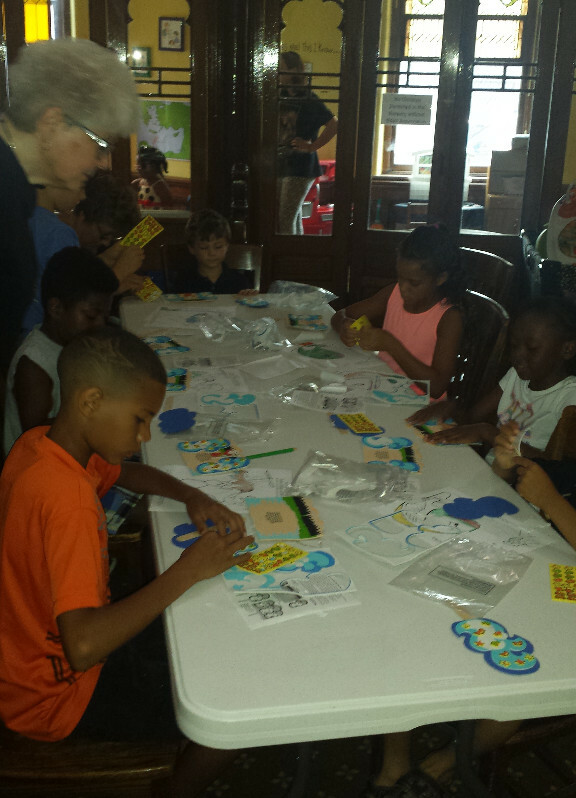 After dinner there will be crafts and games that everyone can participate in. It promises to be a wonderful evening of great fellowship and fun! It's almost that time of year! COOKIES!!! Yes, it's only September, but it's something to think about because the house tour will be here before you can say "homemade Christmas cookies"! Cookie donations will be needed for the Victorian House Tour so that we may sell them in the "Calvary Cafe" that will be set up in the Chapel during the house tour. Also, volunteers are needed to assist with food preparation in the kitchen and also with selling food and beverages in the "Calvary Cafe". The house tour is being held on the evening of Friday, December 11th and all day Saturday, December 12th. Please see Brian Burns if you are able to make cookies, and please see Karen Ferguson if you are able to volunteer your time that weekend. 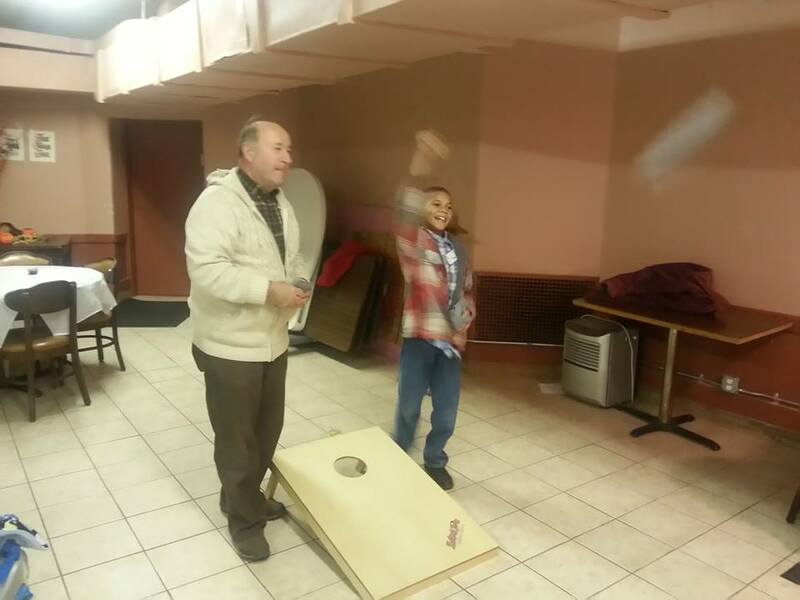 Children of all ages are invited to a Christmas Party at Calvary following morning worship. Lunch will be provided, and the children will enjoy Christmas crafts and games. The 24th Tiffany Concert Season is sponsored by the Allegheny Historic Preservation Society, Inc. This Season features the impact the Arts have on youth resulting in a dynamic, positive impact on community at large that s far reaching to all ages. Exciting family concerts have been especially designed with Pittsburgh's most talented children and youth performers to present this theme. This concert presents “Flute & Harp Fantasy”. Come and experience the enchanting music of heavenly harps combined with many flutes of all kinds including the mysterious alto flute and exotic bass flute. The program will include works for flute choir, works for harp ensemble, and pieces that combine multiple harps and multiple flutes. A special highlight will be Pittsburgh Symphony Orchestra members Gretchen Van Hoesen and Lorna McGhee performing Suite en Duo by Jean Cras. The 24th Tiffany Concert Season is sponsored by the Allegheny Historic Preservation Society, Inc. This Season features the impact the Arts have on youth resulting in a dynamic, positive impact on community at large that s far reaching to all ages. Exciting family concerts have been especially designed with Pittsburgh's most talented children and youth performers to present this theme. This concert presents “Flute & Harp Fantasy”. Back by popular demand, you are invited to experience a delightful afternoon listening to some of the most talented young people in the Pittsburgh area! The program will include Debussy’s impressionist masterpiece Prelude to the Afternoon of a Faun and other works for orchestra, as well as smaller ensembles including Mendelssohn’s String Octet.